How does one go about creating an effective public service announcement about the evils of video piracy in 2016? These things are practically begging to be memed and mocked to death by internet trolls. What PSA, however sincere, could possibly withstand the indignities of 4chan and Reddit? Take Natalie Carbone’s You’ve Been Warned, for instance. Here, a young woman blithely bootlegs Scream 4, only to find herself plagued by a mask-wearing killer in a black cloak. Lesson learned? You’ve Been Warned from Natalie Carbone on Vimeo. 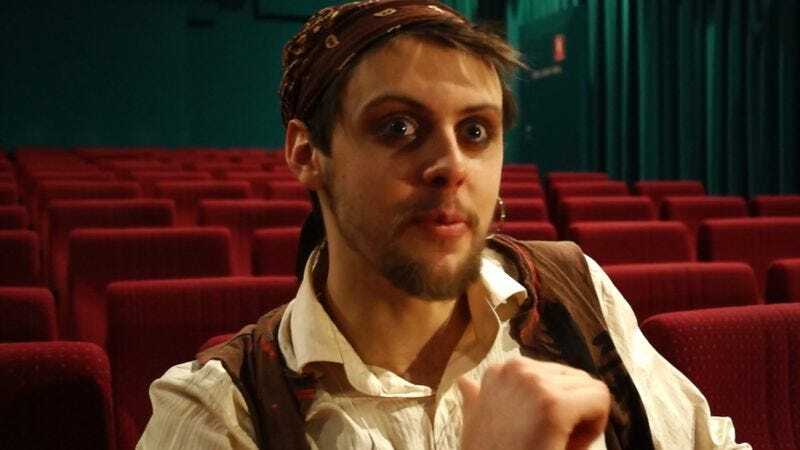 And then there’s Andy Burkitt’s The Pirates, in which a video scofflaw finds herself in the company of some overacting Jack Sparrow wannabes. This also goes on sort of a Christmas Carol-type tangent. The Pirates from Andy Burkitt on Vimeo. Alessandro Frosali’s Echoes takes a decidedly nightmarish, Lynch-ian approach to the subject matter. Echoes | Unscene Short Film Competition Entry from Alessandro Frosali on Vimeo. And then there’s Jesse Wakelin’s black-and-white, Blair Witch-esque Demons Of The Film Industry. Here, the film industry itself is shown to have been brutally murdered, as represented by the image of a wooden plank with the words “FILM INDUSTRY” on it dangling from a noose tied to a tree limb. DEMONS OF THE FILM INDUSTRY from jesse wakelin on Vimeo. You can see many more at the Unscene Short Film Competition website.